Do not underestimate the power of belief to help you accomplish your dreams. Of course, you must work your goals, and do the work, daily. But you must also believe. You must believe in your dreams, and most importantly, you must believe in yourself. Believe that you can and that you will arrive at your desired destination. Your goals are just a journey. Set your course and go. Fuel your dreams with visioning and imagination. Move your dreams forward with daily steps. Daily steps in the direction of your dreams is a proven path to success. The journey is often not glamorous or magical, especially at first and during the hard stuff. But it is possible and achievable. If you keep on going with steady course corrections as needed, you will arrive. This is where visioning comes to play. The power of belief can help or thwart your aspirations. Where dreams meet matter… where the rubber meets the road, is where hard things happen. Don’t let gravity weigh you down. Push against it and grow stronger. The journey is where it’s at… it’s where you will meet, find and friend yourself most. The greatest challenge to becoming your highest version of yourself is a lack of belief in your vision. We can’t know what we haven’t seen. If you’ve never been to the ocean, it would be hard to imagine. Even if you see ocean visuals online it’s not the full sensory experience… the smell of the ocean and taste of salt… the sun-kissed sand between your toes, and the cool foamy white water rushing around your ankles. None of us have ever been to our next level of growth yet. Similarly, it can be hard to become that which we cannot imagine. So we must practice imagining. This is where the visioning process comes to play. It can be hard to become that which we cannot imagine, so we must practice imagining through visioning. And then we get to work. Humanity is still in its infancy of understanding the vast universe of quantum physics. Consider how many people truly understand consciousness, where it lives, how it works… how to develop it. And yet… it is consciousness that drives us. It’s just that for eons, it is our subconscious and unconscious that runs the programs of our lives. It is consciousness that drives us. Best to man the wheel. It is interesting to contemplate how quantum physics—the study of the smallest measurable particles in existence—is actually the study of something as expansive as the vast realm of consciousness. The mining of the depths of consciousness is still elementary. As with education and understanding of anything in life, there are those who can teach it and write books about it, and there are those who’ve never heard of it, and everything in between. Same with quantum physics. Max Planck, is the theoretical physicist who originated quantum theory and won the Nobel Prize in Physics for his quantum mechanics discoveries back in 1918. Wow… that’s 100 years ago!!! And yet today, quantum theory is only beginning to become a familiar public phrase. Chances are that most people still don’t really know what it is. It’s very likely that the future measure of intelligence, will be less about IQ and more about CQ… the Consciousness Quotient. Especially as our education paradigm shifts from memorization to the development of self awareness and consciousness. NOTE: If you like biographies, you’ll enjoy perusing that of Max Planck, which we’ve linked here. Max endured many tragic personal losses while still doing amazing work in the world. Why does any of this matter for our purposes here? Quantum physics matters because visioning has everything to do with consciousness and energy. Visioning, consciously sets energy in motion. 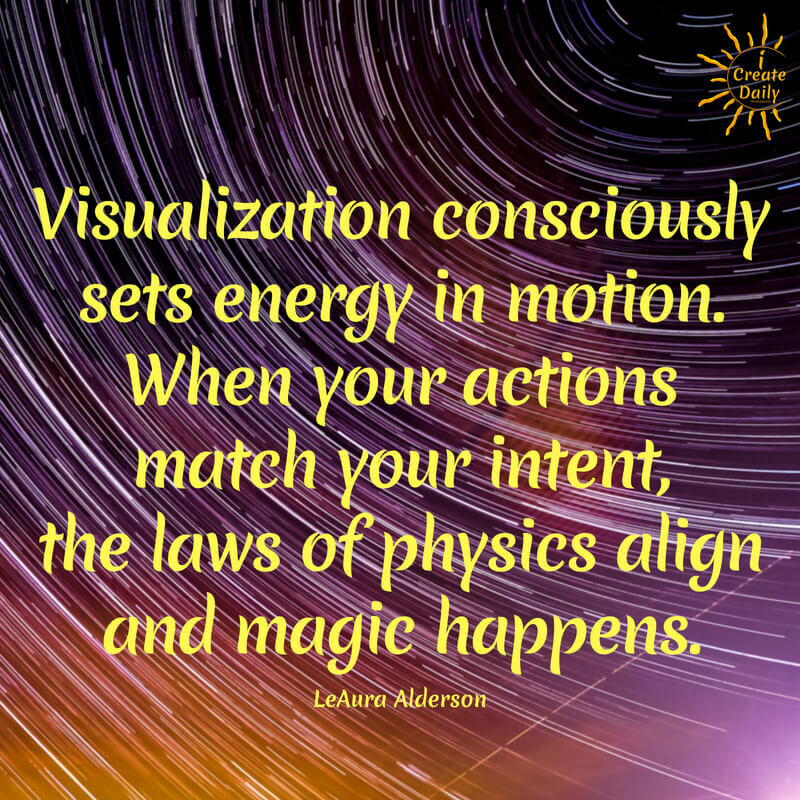 Visualization consciously sets energy in motion. When your actions match your intent, the laws of physics align and magic happens. I do not have a scientific mind and yet the one college class I loved was physics. Physics connected logically and explained some of the more intangible concepts in life such as motion, energy and perception. Physics connects logic with the magic of the universe. You could say that physics studies the principles of energy, matter, and perception. Quantum physics studies the principles of energy and motion of atomic and subatomic particles, the tiniest measurable things known to science, and the effect of consciousness upon matter. Quantum physics could be called ‘the science of consciousness’. Our purpose here is not to understand the science of quantum physics—or even consciousness—as we will barely scratch the surface. Our purpose is to glean how there are vast yet invisible forces at work greater than we can imagine. If you’re spiritual or religious, you understand this as God and the power of prayer. If you have a science mind, you can understand this as universal laws, and an intelligent universe. For our purposes here, it is to recognize the power of visioning as integral to the fulfillment of goals and dreams, because visioning establishes intent and sets energy in motion. Energy in motion is on the way to becoming something real. Luck, is what happens when preparation meets opportunity. This kind of good luck does happen, yet even then it’s almost always on the heels of hard work focused on a goal. Often it is the reward for a labor of love over years of effort. We can drive from the east coast to the west coast, but for most of us, when we want to go to the other side of the country, we take the fastest way there and fly. Visualization is vision + belief + effort + consciousness. Visioning gives wings to your work and legs to your dreams. The visioning process is preparation for success. Begin with the vision of your dream. Act daily in accordance with your belief. Imagine the self you will be when you arrive at your goal. See that self in your daily visioning. There’s much merit in creating some kind of vision board toward visualizing and focusing on your goals. The more you live in your future self… the easier it is to become that self. To help with that, there’s a fun exercise to engage in. Even better if you can do it with others, such as a spouse or partner and friends. If you’re unable (or unwilling) to involve others, you can employ this strategy as a part of your visioning process. Many creatives enjoy the popular “cosplay”. Cos is short for costume, and it’s where you dress up as the characters you want to be. Some fiction authors will incorporate cosplay as a part of getting into character as they’re writing their novel. An author in our community—Drew Carmody— makes homemade costumes, armor, etc, and dresses up as the characters in the book he’s writing. This helps him to further develop his characters by getting into their heads and personalities. When it comes to getting into the character of your future self… (you blossoming), you could consider hosting your own party to do this, or just recruit a friend or two. It’s an exercise I experienced in a private mastermind event with Jack Canfield, Chicken Soup for the Soul and Success Principles fame. This is a come-as-you-will-be costume party, and you don’t have to wait for Halloween! It’s most fun when done in a group setting, but even if it’s just you and a friend or two, it’s fun to engage. In this Come as You Will Be Party, you dress in the attire that will help place you in “character” for your future self, (as defined by you). So ponder where you want to be in your life and career in five years in all aspects of your life. Tell yourself the story of where you are in 5 years. Then you get into character, as your future self. Get into character, as your future self. All your invitees will also be coming as their 5-years-older selves, and all will get in character from the moment of arrival or even before, and remain so for the entire event. Some have gone all out for these experiential parties… including black tie and limousines even, if wealth and fame was their goal. For others, arriving in flip-flops, shorts and Hawaiian shirts fits their future vision. You arrive and greet each other as you will be in 5 years according to your goals. Staying in character from the beginning to the end. When meeting friends, imagine you’re seeing them for the first time in five years—even if you just saw them yesterday—and you each take turns sharing about all the wonderful things you’ve accomplished and are doing now, 5 years later. Goals are the stepping stones to the secret garden of success. Tenacity is the key. Stay in character! Converse, ask, answer and act only as your future self. Sure, it’s awkward at first, especially if you’re not into theatre and cosplay normally. It was for me. But be willing to play all out, and hold steady with the plan and with your dream. As you relax into being your future self, it will become a part of your identity, which will help it to come true sooner. Observe yourself relaxing into the ‘who’ you want to become. Whether your visioning or engaging this activity with friends, hold your vision of your success so firmly in thought, speech, posture and mindset that it will feel real. You will soon feel yourself behaving differently and as your more idealized self. Your friends will be doing the same thing, so you each will help elevate the other into that future self and anchor it in your consciousness in this way. Enjoy yourself… envision this in as much detail as possible. Like the athletes visualizing their future performance, the more detail you can add the more real it becomes to your psyche. It’s like issuing instructions to your unconscious and subconscious minds, which then set off to work for you every day and every night. Visioning issues instructions to your unconscious mind and sends it off to work for you. But you must support it with conscious effort. In my family we tend to use our Mac’s Keynote app (like PowerPoint on PCs) for constructing dynamic vision boards. I prefer digital things because it’s easier for me to create and update them. Some people—especially visual artists—prefer to draw or paint theirs on journals, canvas, posters or whiteboards. Whatever works best for you is what’s best. If you’re not sure try different things until you find a good fit. You are the master architect of your life and construction begins at the quantum level. Have fun creating the blueprints for your future…. Then build it daily. Visioning directs consciousness and sets quantum matter in motion. The more conscious the effort, the greater the motion. For more on the “5 years from now self”, and the concept of creating a vision for your future, you might enjoy this article on Jack Canfield’s site. The article shares some interesting examples of people who excelled using the visioning process and also more on the fun 5-year-party idea you could enjoy with friends. If it’s not for you to host a real “5 Year Party”, then at least visualize this for yourself, daily. Hold your vision of your success so firmly in thought, speech, posture and mindset that it feels real. Add daily effort and it will become real.